Mika isn’t the only loyal dog out there. Dogs are legendary for their loyalty. We all know the story of Lassie, a devoted collie who overcame a long and dangerous journey to be reunited with a young boy she loved. There are also many real-world canine loyalty stories out there, like the one from earlier this year about Ciccio, a German Shepherd in Italy, who reportedly goes to church every day and waits patiently for his recently deceased owner to meet him there. Or the heartwarming story of Hawkeye, a Labrador Retriever who famously laid down next to the coffin of his owner Jon Tumilson, a US soldier who died in combat. Mika has an amazing internal clock. For example, every day when the clock hits 4:59 p.m. she knows it’s time to eat…and she will get her food no matter what. It’s pretty incredible, because you can’t trick her to think otherwise. She just knows. She also stays away from people who she deems threatening, as many dogs do. Persistence pays, and nobody knows that better than a dog. When was the last time your dog sat frozen next to you through an entire meal, gazing up with his Bambi eyes, drool dripping from the sides of his mouth? How many times have you caved and tossed him a bite by the end, impressed by his determination and patience…all for a tiny, momentary pleasure? Once you’ve decided to do something (after assessing the potential risks and benefits), why not reach for the stars with it? I’ve found that in business, if you strive to hit a place one or two steps beyond the foreseeable goal, the realm of possibilities expands. It’s how I plan things and I like to encourage my employees do the same: push past boundaries and pursue opportunities that they might have initially thought impossible or too big. It’s important to know your worth and set the stage for the future. When I built HootSuite I had no idea that it would one day be used by millions of people around the world, in major political revolutions and by huge corporations like Pepsi and Virgin. 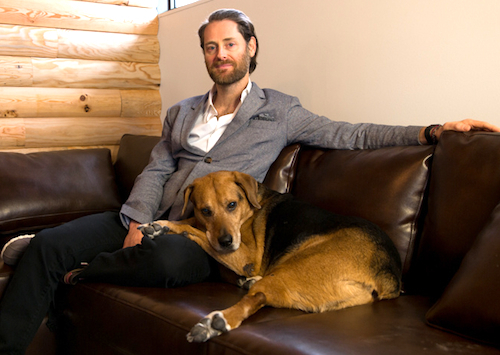 My current goal, which I’ve made public, is to make HootSuite a billion-dollar company. When people tell me it’s not possible, I wonder if I should make it two billion instead! With technology penetrating our lives and jobs more than ever, it’s easy to be online and working 24-7. But it’s very important to regularly de-stress and refresh your mind and body. In fact, there’s a lot of research that suggests exercise can even improve productivity. So no matter how busy (you think) you are, turn off your digital devices for a bit, get outside and run your heart out. Take it from Mika—you’ll have a better night’s sleep if you do. Do you have a trusted canine companion? What lessons have you learned from your dog in life and business? You can follow Ryan at @invoker and Mika at @MikaHoots on Twitter.